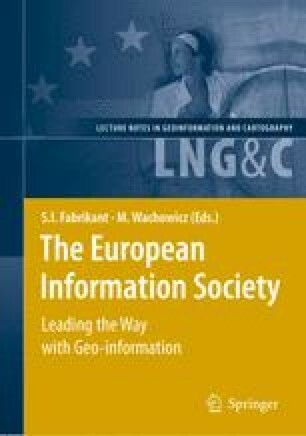 The growing recognition of the crucial role geographic information plays within the Knowledge Society, the recent advances on geographic information technologies, the continuous demand for professionals in these areas and the use of new information and communication technologies in teaching and learning processes, are all factors which concur for a better systematization of Geographic Information Science Curricula in order to improve its accessibility and efficiency. The program contents, the teaching methods to be implemented, the policies context and the underlying notion of curriculum, have led to the establishment of a Curricula Development Model that is trying to answer a set of challenges/opportunities situated at different levels (pedagogical, educational, political-institutional and technological).The ontological-based approach translates the concern with integration and articulation of the curriculum, and the need for the development of a properly documented and structured methodology that allows for the definition and explanation of the processes considered fundamental for an effective improvement and innovation of wide-ranging curricula in this area. Berdusco B. (2003) Results of a Survey of Known Higher Education Offeringsin GIS and GISci [cited 23 January 2005]; Available from:http:http://www.institute.redlands.edu/kemp/Berdusco.htm. Kemp, K.K. and M.M. Goodchild (1990) NCGIA Core Curriculum in GIS.National Center for Geographic Information and Analysis [cited 7 March 2005]; Available from:http://www.geog.ubc.ca/courses/klink/gis.notes/ncgia/toc.html. Gonzalez, J. and R. Wagenaar (2003) Tuning Educational Structures inEurope-Final Report: Phase One [cited 23 March 2006]; Available from:http://tuning.unideusto.org/tuningeu/. González, J. and R. Wagenaar (2005) Tuning Educational Structures inEurope II-Universities contribution to the Bologna Process [cited 23 March 2006]; Available from: http://tuning.unideusto.org/tuningeu/. Smith, M.K. (1996) Curriculum theory and practice. The Encyclopedia of InformalEducation, [cited 10 July 2005]; Available from:http://www.infed.org/biblio/b-curric.htm. Nair, P. (2003) Imperatives for Change in Higher Education-Planning theFuture of the American Campus [cited 30 January 2006]; Available from:http://www.designshare.com/Research/Nair/HigherEd/imperatives_higher_ed.htm. CORDIS (2006) Nine ideas to bridge industry-academia gap Taking ERAfurther-The role of the universities [cited 24 November 2006]; Availablefrom: http://cordis.europa.eu/era/universities.htm. Tomkins, G.S. and R. Case (2006) Curriculum Development, The CanadianEncyclopedia [cited 22 May 2006]; Available from:http://www.thecanadianencyclopedia.com/index.cfm?PgNm=TCE&Params=A1ARTA0002083. Daniel E. (2006) Curriculum Notes. INLS 242: Curriculum Issues and theSchool Library Media Specialist [cited 23 March 2006]; Available from:http://www.ils.unc.edu/daniel/242/CurrNotes.html.